Livia Drusilla is certainly one of the most influential women in history, yet most people have never heard her name. For 50 years, she ruled alongside her husband, Augustus, by all accounts assisting him and having a say in the decision-making. Her favor could make or break the fortunes of many people. Even after Augustus’ death, she continued to hold a great deal of sway in the political arena. Still, because of the customs of the times in which she lived, Livia had to appear a modest wife, mother, and widow. family from Rome. She was first married to a man named Tiberius Claudius Nero, a friend of Julius Caesar. In the turmoil that gave rise to the second Triumvirate, Tiberius Nero had sided with Mark Antony and not Augustus. In time, Tiberius returned to Rome to make peace with Augustus. With him was Livia. They had one son, and Livia was pregnant with a second child. Augustus was married to Scribonia, who was also expecting a child—a daughter whom they named Julia. it is said he immediately fell in love and, using his influence as the ruler of the empire, asked Tiberius Nero to divorce her. Augustus then divorced Scribonia and married Livia. At the wedding ceremony, Tiberius Nero gave her away, as a sign to all that everyone was in agreement. The marriage did last—until Augustus’s death, 51 years later. allowed to hold public office or to vote, so, to gain power and influence, they had to use other means. Aware of the respect Augustus granted Livia, many people went to her for help. Records do show that she was influential in promoting the careers of many politicians. were reviled by conservative Roman society, Livia had to play the role of a traditional Roman wife. In fact, Augustus often noted publicly that Livia not only made all his clothes, but that she also wove the cloth she used to make them. 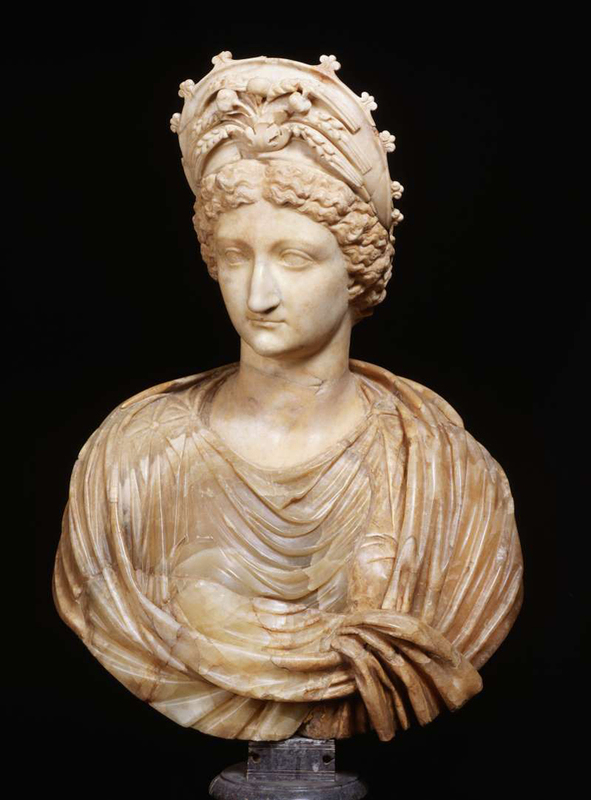 Custom dictated that Livia take charge of managing the emperor’s household, which she did. She also helped Augustus ensure his legacy by encouraging him to name an heir and then adopt him. to name his sister’s son, Marcellus. After he died, at the age of only 19, Augustus looked to his own grandsons, Gaius and Lucius, the children of his daughter, Julia. Both, however, also died young. Roman historians were quick to cast the deaths as suspicious because the next heir Augustus chose was Livia’s son, Tiberius. They questioned whether Livia somehow had been involved in their deaths. Whether she did or not is uncertain, as no positive evidence has ever been uncovered to answer “yes” or “no” to this question. What is certain is that the four emperors who succeeded Augustus all trace their lineage to Livia. Livia definitely did try to influence her son’s decisions once he became emperor. In fact, some historians have noted that she controlled him. What is certain is that there was friction between the two. the honor of being called Augusta and was adopted into the family of Julius Caesar. As with Augustus and his adoptive father, Julius Caesar, Livia was also deified after her death and worshiped by the Roman people.